Time is a finite resource—and we want more of it. Time famine, as defined in 1988, refers to the universal feeling of having too much to do, but not enough time to deal with those demands. Thirty years later, this feeling is familiar to everyone regardless of age. In our digital, always-connected world, there's no escaping the demands of a fast paced life. Not when our phones, laptops, and watches keep us up-to-date and informed at every waking (and resting) moment. At rDialogue, we believe in five key drivers of loyalty: access, information, financial value, recognition, and lastly, time. In our opinion, time is rapidly growing in importance as a loyalty driver. 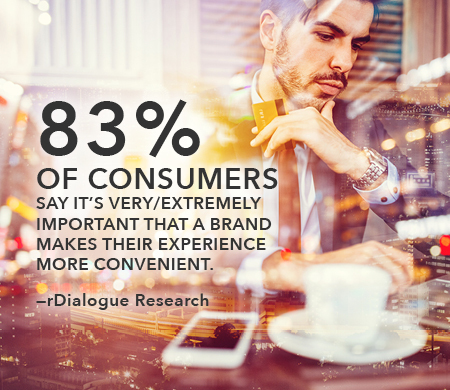 Brands that value a customer's time by respecting it and giving them relevance are strengthening the relationship formed between a brand and a customer. Thank you! You will be receiving an email shortly.